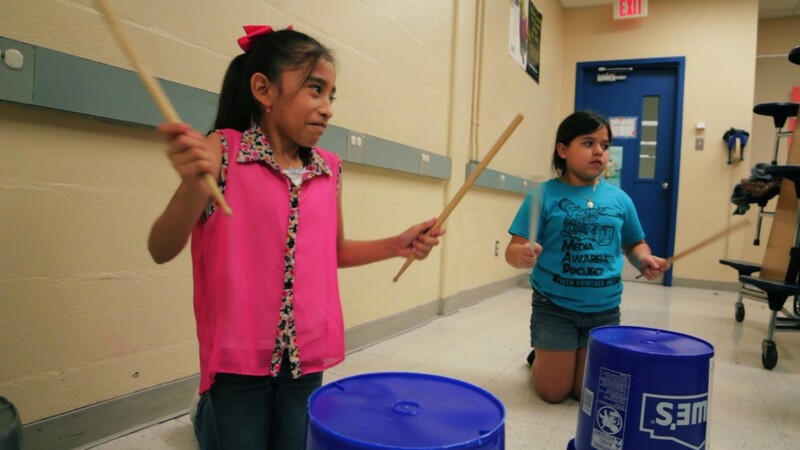 After-school program Roots & Rhythms teaches drumming to underserved, bilingual students. Video produced by Eve Tarlo and Galia Farber, shot by Christopher Kim and Robert Avila and edited by Anna Ramirez, KLRU‘s Arts in Context. Sevylla del Mazo teaches drumming to fourth and fifth grade students in one of the worst neighborhoods in Austin, Texas. The zip code that houses her school has one of the highest dropout and teen pregnancy rates in Austin, but del Mazo sees her music class as a way to reach her students. The music teacher and founder of Roots & Rhythms, an after-school drumming program, lets her students draw inspiration from her while they drum on recycled buckets. Ninety-six percent of her students only speak Spanish and many come from homes where parents are illiterate in English and Spanish. Del Mazo hopes that her multilingual abilities will teach the students to embrace their own culture and language.